Southern Skywatch February, 2017 edition is now out! The Moon on February 11 at 23:43 pm ACDST in Adelaide just before the Moon covers Regulus. Similar views will be seen throughout Australia at the equivalent local time. (click to embiggen). The February edition of Southern Skywatch is up (still late again, sorry, but better). This month starts with Venus and Mars lined up close in the evening sky. Jupiter enters the evening sky, and is less than a hand-span from the bright star Spica for this month. On the 15th it is not far from the Moon. Saturn climbs higher in the morning sky during the month. On the 21st it is close to the crescent Moon. Mercury, sinks back towards the horizon and is lost to view by mid month. The asteroid Vesta is visible in binoculars in the latter half of the month. 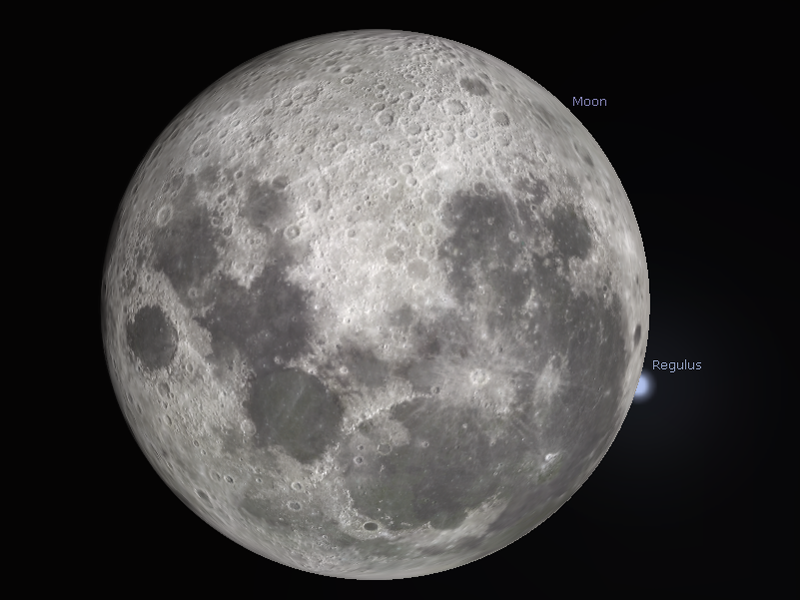 The Moon occults the star Regulus on the 11th. Comet 45P is closest to the Earth of the 11th as well. The maximum of the variable star Mira is in late February.